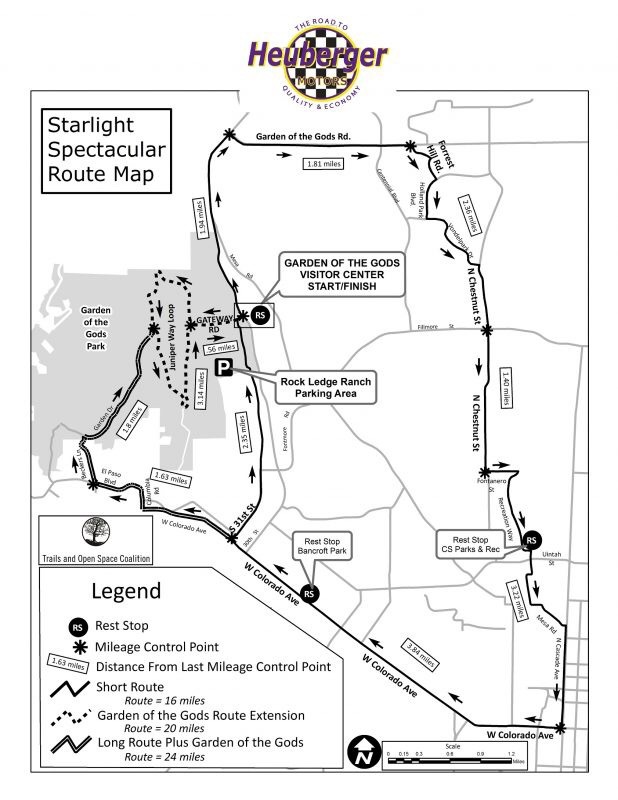 For 22 years, the Starlight Spectacular has been raising funds for the Colorado Springs-based Trails & Open Space Coalition. We first heard about the ride at an Outdoor Sports Expo at Ivywild School (no longer a school) in Colorado Springs. 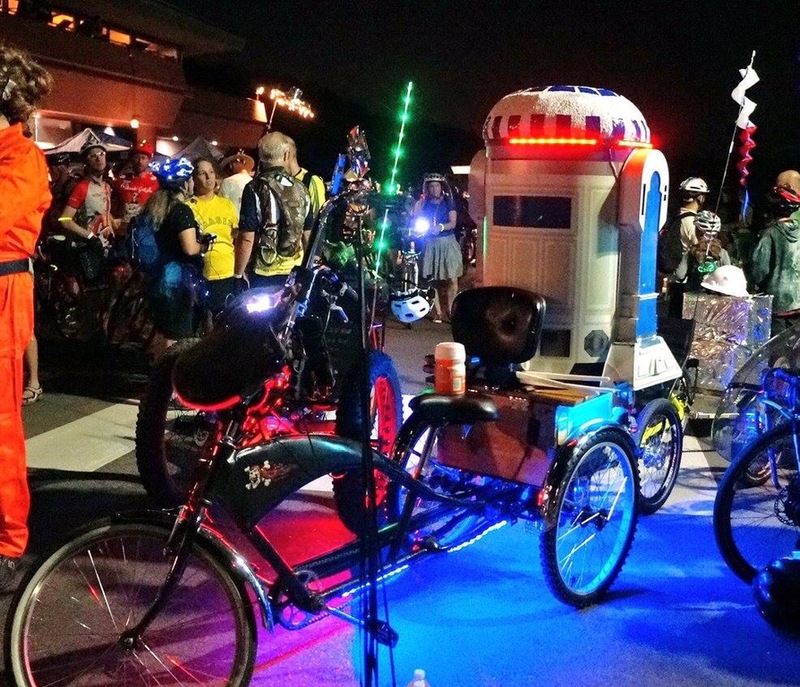 A few weeks ago we decided to sign up for the ride and I set about ordering the components of our night-biking kit. Sorry BSG and Firefly, but Picard and Dr. Crusher and Worf and Data (and of course Lt. Yar) are still my space heroes. 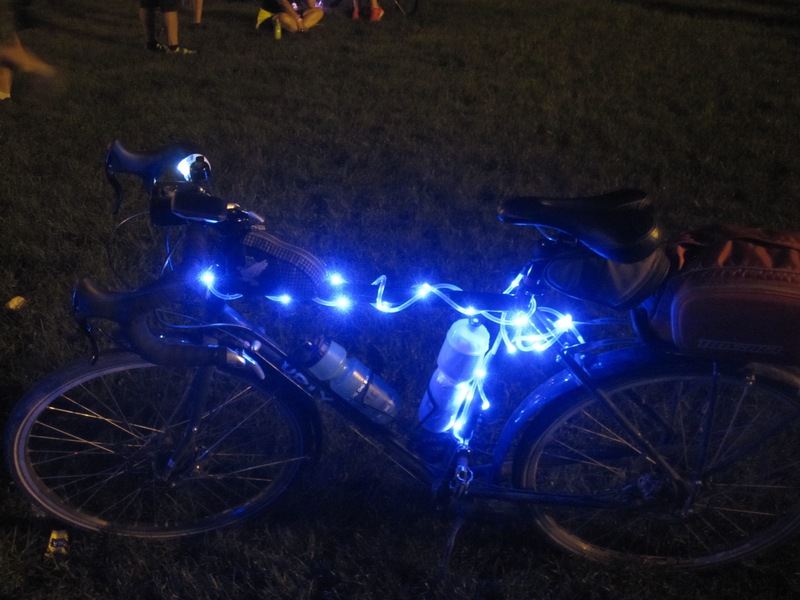 I also obtained some blue LED rope lights to decorate our bikes. 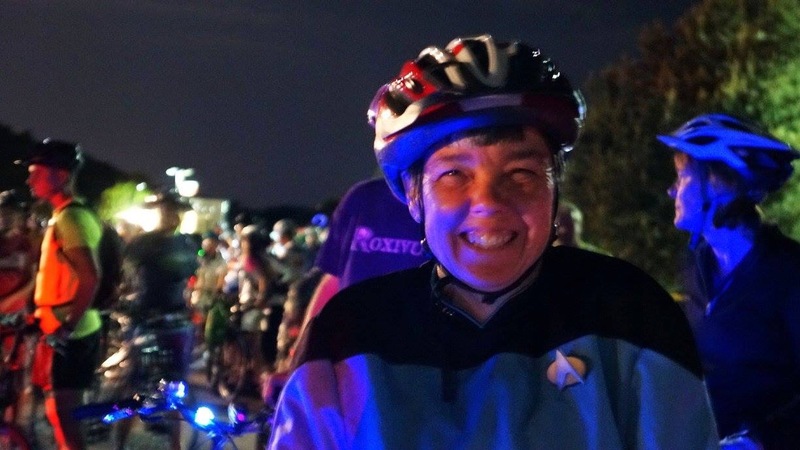 This turned out to be a good idea, as it is surprisingly difficult to spot one’s riding companion in the dark and much easier when her bike is glowing blue. 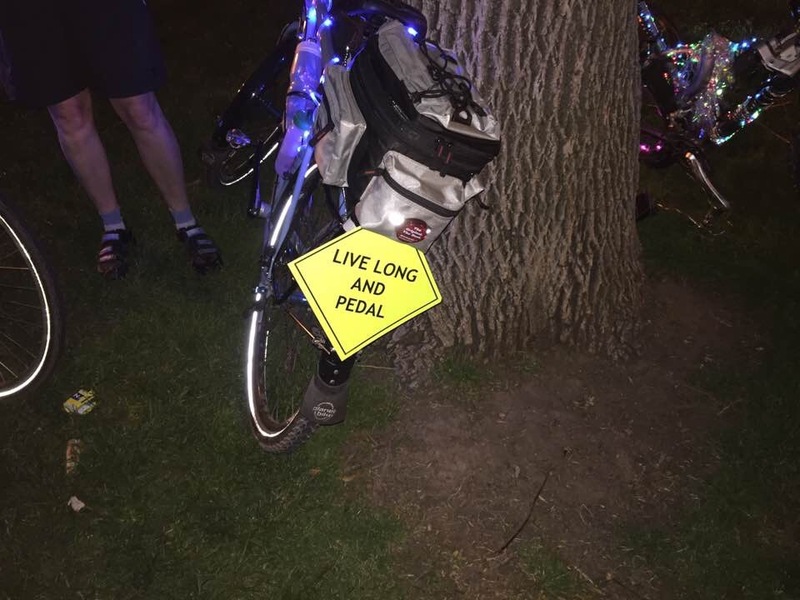 I also had an appropriate sign for the back of my rig. We arrived pretty early to the ride and had a nice chat with the folks who won one of the costume contests with R2D2. 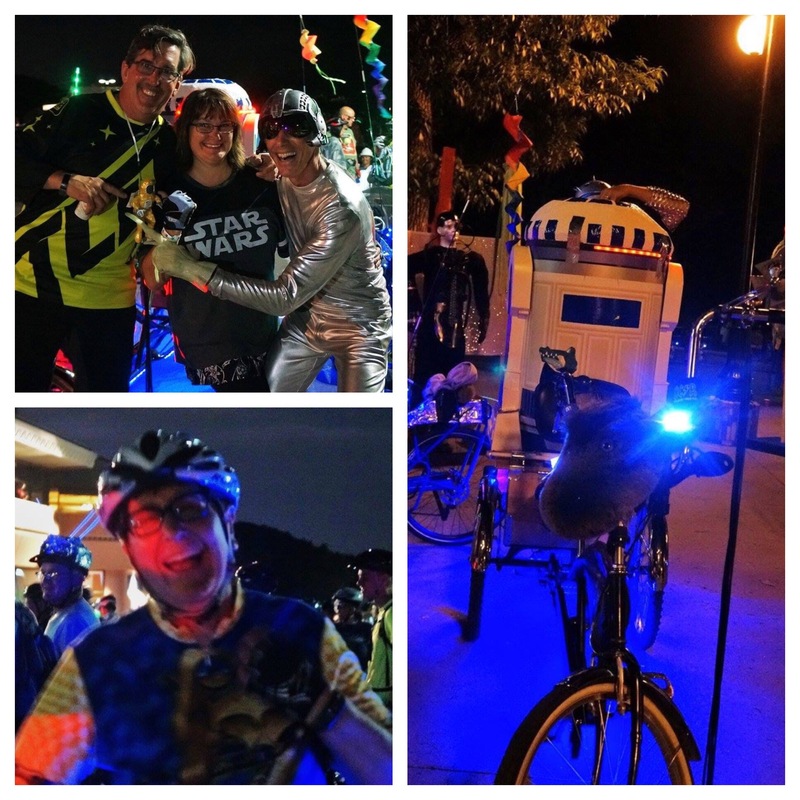 After our bikes were illuminated, we rode up to the Garden of the Gods Visitor Center to pick up our packets. We stopped at the Subaru tent on the way, acquiring a patch kit, lip balm, lights, and valve lights–yay swag! Packet pickup was orderly, but the bags contained little beyond the event t-shirt. We were still quite early, so we grabbed a slice of the included Marco’s pizza and sat down to people-watch. When we decided to join the starting mêlée, we ran into our friend Stephanie from Pueblo, who was taking pictures and enjoying the night. The start was in waves, which was a good idea given the crowd and darkness. We were on the “long” route, so we first headed into Garden of the Gods. It was hilly. And a bit crowded. It got more crowded when we circled back to the Visitor Center and merged with riders from the “short” route who were just starting. One had to be really careful to avoid riders who decided to stop without moving out of the center of the road. After a while, the crowd spread out a bit and riding became easier. We did skip the first rest area due to the “chaos” factor, though. I could have used a cookie, but it just wasn’t worth it. By the time we reached the second rest area, we were able to stop and get a small snack. A bit later, we continued on the long route while the short route riders turned back. 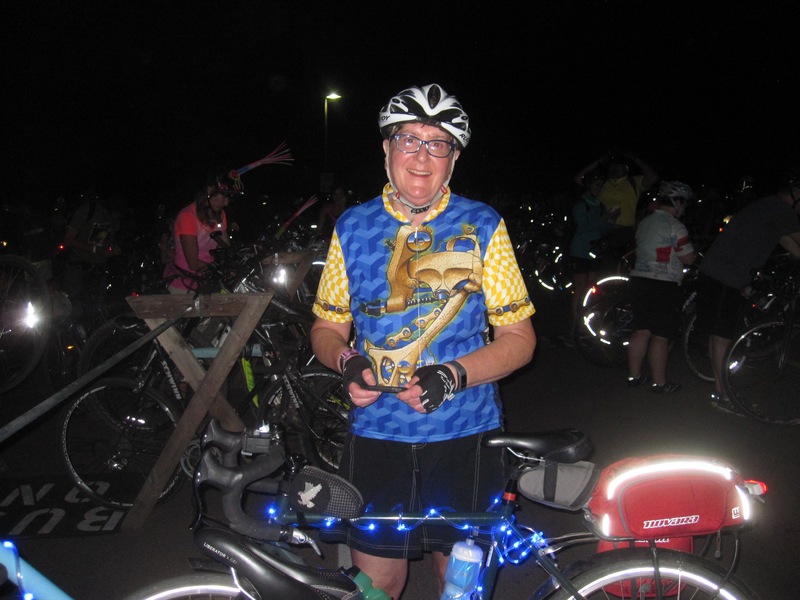 We passed our lodging, Buffalo Lodge Bicycle Resort, and got some additional snacks and photos. The next part of the ride was dark and unsigned; definitely the biggest “directions fail” of the ride. We found some other riders after a few minutes, then rode uphill back into Garden of the Gods. The last part of the ride, though challenging, was also the most beautiful and peaceful (sadly, the darkness was not conducive to photographs). Wow, that looks like such a great time!!!! !